“Freedom” and “independence” they cried…undeterred by the Spanish government’s moves to rule their region directly from Madrid. 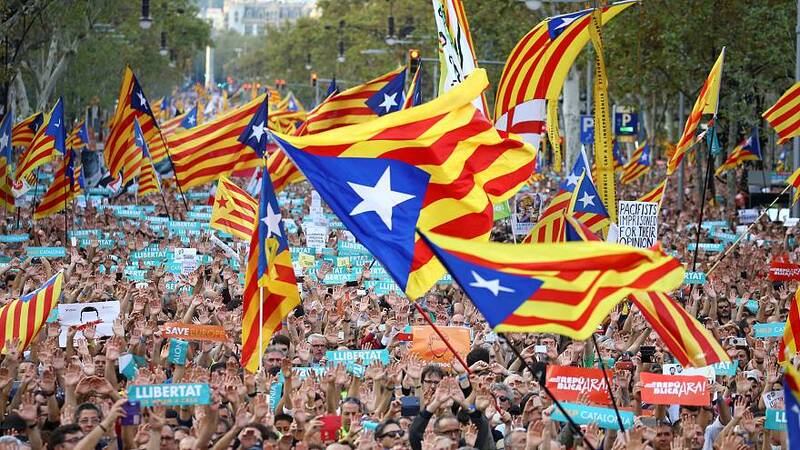 Huge crowds poured onto the streets of Barcelona on Saturday, demonstrating that Catalonia’s breakaway bid goes on, despite what its pro-independence leader has called “the worst attack” on the region’s institutions and people since the Franco dictatorship. In a televised speech, Carles Puigdemont said they would not accept it. He would call a session of parliament to decide how to respond to what he called “this attempt to liquidate our government and our democracy”. And he spoke in English, to warn that “European values” are at risk. Earlier on Saturday, Spanish Prime Minister Mariano Rajoy announced that his government had taken the unprecedented decision to curb the powers of Catalonia’s parliament, fire its government and call an election within six months in a bid to thwart the autonomous region’s push for independence following a referendum deemed illegal by Madrid. He insisted that Catalan self-governance wasn’t being suspended and that the measures were rather to “remove the people that put that autonomous government outside of the law and constitution”. “Self-governance will not end,” he said. A vote is now scheduled for next Friday in Spain’s upper house, the Senate, where the measures must be approved. That seems a foregone conclusion as Rajoy’s ruling conservatives have a majority in the chamber as well as support on the issue from the main opposition.